The Los Angeles Kings have signed unrestricted free agent defenseman Austin Strand to a three-year entry-level contract, Kings Vice President and General Manager Rob Blake announced on Nov. 27. 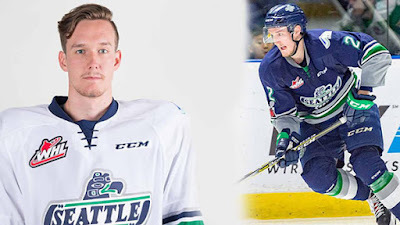 The 20-year-old Strand (born Feb. 17, 1997) is a 6-4, 216-pound native of Calgary, Alberta who has appeared in 24 games this season with the Seattle Thunderbirds (WHL), posting 26 points (10-16=26) and 29 penalty minutes in his fourth season in the Western Hockey League. Among league defensemen, he currently ranks first in power play goals (9; tied for second among all players), tied for first in goals, tied for fifth in points, tied for 10th in assists and tied for second in game-winning goals (2). In his first full season with Seattle (acquired from the Red Deer Rebels last season), he was named an assistant captain. Strand has appeared in 223 career regular-season games in the WHL between Seattle and Red Deer, recording 84 points (25-59=84), a plus-1 rating and 196 penalty minutes. He has played in 37 postseason games, tallying 17 points (6-11=17), a plus-11 rating and 47 penalty minutes. During the 2016 WHL playoffs with Red Deer, he helped lead the Rebels to the Eastern Conference Championship, before falling to the eventual champion Brandon. However, since the Memorial Cup was in Red Deer, he played in his first Memorial Cup, losing in the Semi-Finals with the Rebels. After being traded to Seattle during the 2017 regular-season, he helped the Thunderbirds win the WHL Championship and earn his second consecutive berth in the Memorial Cup.